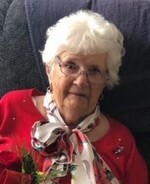 Marguerite Adams-Morrison-Nardone, Age 99 of Manistee died February 6, 2018 at Green Acres of Manistee. She was born on September 15, 1918 in Hazel Park, Michigan the daughter of the late Charles J. & Wesley F. (Parker) Partlow. Marguerite married Selwyn C. Adams in 1937 and he preceded her in death in 1963. She married Ronald J. Morrison in 1964 who died in 1971. In 1977 she married Ernest A. Nardone who preceded her in death in 2008. She enjoyed being with family, traveling, playing cards, & gardening. She also was preceded in death by her sister; Alice Fair, daughters & son-law; Patricia & Ken Lee and Deborah Nardone, and granddaughter; Terri Lee Cain. Memorial Services for Marguerite will be held Friday, September 14, 2018 at 11:00 AM at Trinity Lutheran Church in Arcadia with Pastor Jim Metcalf officiating. Interment will be in Glen Eden Cemetery in Livonia. The family will receive friends at the church on Friday from 10:00 AM until time of services. Memorials in Marguerite’s name may be directed to the Bear Lake Fire Department. Please visit Marguerite’s personal page of memories at www.oakgrovefh.com. Arrangements by the Oak Grove Funeral Home & Cremation Center in Manistee. To send flowers to the family of Marguerite Adams-Morrison-Nardone, please visit our Heartfelt Sympathies Store.